Tomorrow we go for our anatomy ultrasound and I am BEYOND excited! It feels like I'm waiting for Christmas morning or a trip to Disney World. I can't wait to stare at our sweet baby moving on the screen for a whole hour, AND I can't wait to find out if baby is a little man or little lady. How wild is that and how amazing?! T.J. (and everyone else) has probably asked me every day since I got pregnant if I had feeling about the baby's gender. He has his prediction and while I mostly feel the same I've tried to stay pretty neutral so that I'm not dead set one way or the other. I had a dream early on it was a girl but the other week I had a dream it was a boy so I really have no idea. Obviously it's a 50/50 chance and we will be thrilled with either a son or daughter. I just can't believe I'm actually going to have a son or a daughter in about 5 months! Oh my gosh, oh my gosh, oh my gosh!!! We are going home in a few days and I can't wait to share the gender with our families in person! I am also excited to finally be able to buy some cute and oh so tiny baby clothes, and start referring to the little nugget as "he" or "she" rather than "baby" or "it." So what do you think? Boy or girl? As a Hodgepodger I know how excited you and your family are - plus my first grandchild is due in June. We already know it's a boy (thanks to an early genetic test that was done) Enjoy the scan tomorrow. Can't wait to hear! 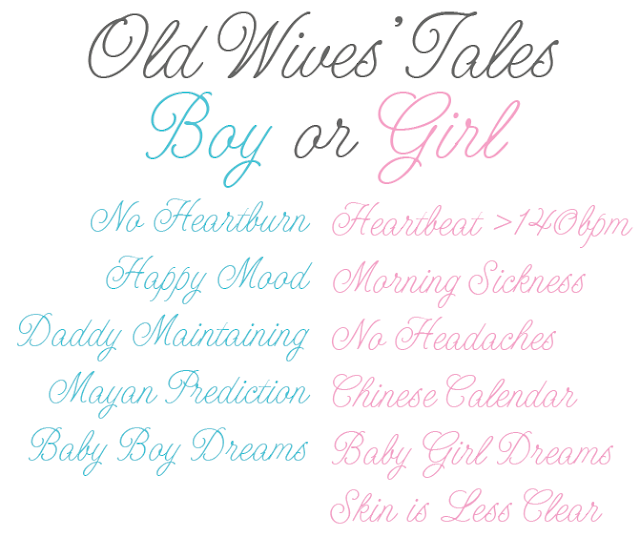 A lot of the wives tales were true for us - daddy gaining too, skin breaking out, heartbeat over 140, and the Chinese calendar. We found out early (at 14 weeks) because I am so super impatient I couldn't take it any longer! I will definitely be intrigued to see which wives tales line up for us. I can't believe I ever wanted to wait to find out till baby's was born. I could barely last night I was so excited! !